When an airline overbooks a flight, it must find someone to give up a confirmed seat and agree to travel at a later time. The question is this: will travelers give up their confirmed seats voluntarily? Or will this be a case in which involuntary bumping occurs? You might wonder why anyone would agree to a voluntary airline bump. Why should your air travel be inconvenienced because an airline overbooked? The answer lies in the possible compensation that is offered. Airline employees don't want to bump you and face your righteous indignation. So they are generally pleased when someone agrees to be bumped. The U.S. Department of Transportation requires airlines to ask for volunteers before they deny boarding to a confirmed passenger. If you want to trade delay for airfare reward, make it clear that you're willing to volunteer and negotiate a settlement. The U.S. DOT does not dictate compensation for a voluntary airline bump. Amounts are left up to the individual airlines and their passengers. As a budget traveler, naturally you're interested in earning potentially free future air travel in exchange for some (hopefully minor) inconvenience. What should you do next? One of the best strategies is to get to the airport well in advance of your flight time and check flight status. When you do, simply ask the airline personnel if your flight is overbooked. It's not classified information. They'll almost always give you an answer. 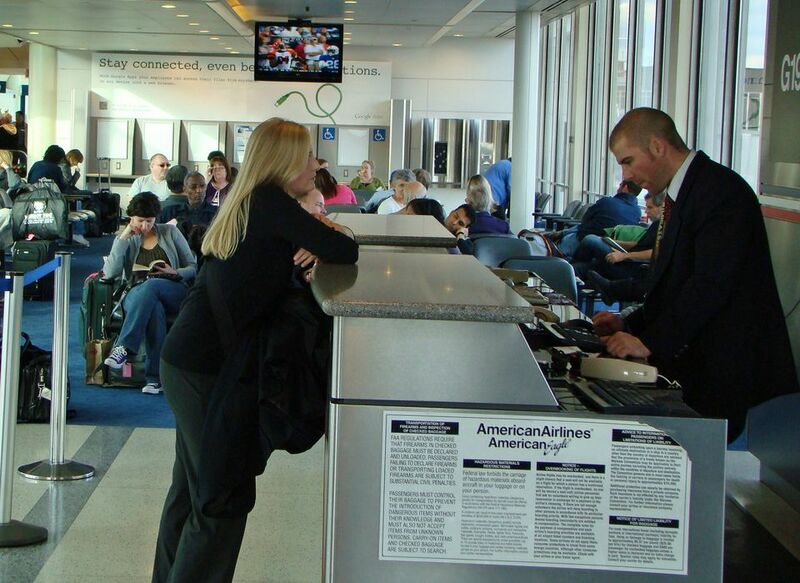 Keep in mind that when involuntary bumping occurs, gate personnel usually feel some backlash. In fact, they don't necessarily enjoy asking for volunteers. So your polite inquiry about overbooking probably will be welcomed, as will word that you'd consider being bumped for compensation. Don't commit to anything just yet -- simply let them know you'll consider it. If you have a smart phone, do you have an application that connects you to flight schedules and flight status? Can you access the Internet to find such information? For those low-tech budget travelers: are you willing to carry some flight schedules in your bag? You need to know just how inconvenient this airline bump is going to be for you. Flight schedules, and the current flight status of potential alternatives, are the keys to your decision. Some airlines look at a 45-minute delay and a six-hour delay as one in the same, at least in terms of how they might compensate you. With longer delays, you'll probably get a meal voucher. When an overnight is required, the compensation increases and also includes a hotel room voucher. For a six-hour delay, is $200 in future free travel enough? Generally, my answer is "no." But if the pot can be sweetened with entry into the airline's V.I.P. lounge, the deal improves. You'll have to put your own prices on time and inconvenience. That's not an easy thing to do off the top of your head, so give it some thought before you volunteer. Key Question: What Follows the Overbooked Flight? You've just agreed to an airline bump. Now what? Once when I was bumped, I literally had to run to another gate to catch the next flight. What perhaps is more typical is a leisurely walk and a long wait at another gate. What is the situation in this terminal? Will you be reasonably comfortable? The picture here was taken during an airline bump at O'Hare International in Chicago. The views and amenities were enough to keep me interested for a while. But in an overcrowded terminal at the height of the holiday season, will you even find a decent place to sit? What are your food options? What is the current flight status of your alternative? Sometimes, being stuck in a small airport with few options for entertainment or dining is a rougher deal than an airline bump in a major hub. At other times, the major hub might be more uncomfortable than a small airport. You must determine the situation on your day and time. I once volunteered to be bumped from an American Airlines flight. The bidding started at $200 and a free travel voucher. I use the term "bidding" loosely. It was an offer over the public address system that no one took on this particular day. It went to $250. Still no takers. At $300, I jumped up and offered to be bumped. Delta Airlines has literally started a bumping auction. They want to take silent bids online from travelers who are willing to be bumped and then (in theory) reward the lowest bidder. This occurs before you leave for the airport. Delta promoted the bidding system on grounds that it will make gate operations smoother. But clearly the airline will benefit when inexperienced travelers bid too little or experienced travelers undercut each other. Southwest Airlines sometimes offers a voucher plus the cost of your flight tickets. In short, each airline approaches this common problem in a variety of ways. Don't be afraid to negotiate! If an airline bump delays you by more than about two hours, it's reasonable to receive a voucher for a free meal within the airport. Customer service being what it is these days in the airline industry, you might not be offered this basic courtesy. If you're not offered one, you should ask for it. Obviously, airlines will put you up in a hotel if your new flight is the following day. Generally, they have arrangements with nearby airport hotels and you simply present a voucher to the front desk clerk, who might want your credit card anyway "for incidentals." Do not expect to get a five-star room or a five-star meal in this situation. Although there might be cases in which the hotel upgrades you to a suite because it's all they have left, these instances are rare. You should be reasonable in your expectations. The same is true of the compensation you receive. Few airlines offer cash in these situations. They'll give you a voucher for future flight tickets on their airlines. That way, they'll receive repeat business. Demanding cash or some outrageous benefit for your trouble will be met with rejection. Be reasonable. On U.S. domestic flights, you can see the compensation picture for an airline bump is fairly murky at best. Much depends on the individual airline's policy, although as we've noted the U.S. government does require the carrier to ask for volunteers before making an involuntary bump. The picture becomes murkier when you consider international flights. Some countries have regulations related to an airline bump; many do not. It never hurts to make some inquiries of your travel agent or do an online search prior to departure. Know the policy with which you will contend in the event of overbooking. In the European Union, there are some basic legal rights: two hours of delay entitles you to a meal, refreshments and two phone calls, or access to email or fax; next-day arrangements entitle you to a hotel room at no cost to you; delays of five hours or longer bring the option of reimbursement of the full cost of the flight tickets and a return fare to the first point of departure. When involuntary bumping occurs on a U.S. domestic flight as a result of overbooking, you should receive in writing an explanation for how you were chosen to be bumped and a list of rights you have in this situation. Such a written statement is required by law. Compensation is required, but rather vaguely specified. This is when the cost of your one-way fare becomes significant. The airline can escape paying compensation if their flight schedules allow you to get to your destination within an hour of the originally booked flight. If the delay is between 1-2 hours, "the airline must pay you an amount equal to your one-way fare to your final destination that day, with a $650 maximum." After the delay exceeds two hours, "or if the airline does not make any substitute travel arrangements for you, the compensation doubles (200 percent of your one-way fare, up to $1,300 maximum)." These quotes come from the U.S. Department of Transportation. Note that on international flights, there are slightly different wait times tied to compensation: 1-4 hours for the one-way fare, and more than four hours for the doubled compensation. When I get bumped, I like to receive free air travel as compensation -- at least enough to cover a one-way fare in the future. But some budget travelers will work out a deal in which they are upgraded to first class on the next available flight following the airline bump. Don't be surprised if the gate attendants consider your request unusual. These days, finding a free airline upgrade is fairly difficult if you are not a decorated frequent flier. Since many budget travelers do not fall in this category, a free airline upgrade can be quite elusive for many of us. But here is a way for you to upgrade to a more comfortable seat without spending any real money. Make sure it is worth your time. First-class or business-class flight tickets on a 50-minute flight aren't worth too much. But if you'll be upgraded on a lengthy flight, a short wait in the terminal could make that flight much more enjoyable. Why Does Overbooking Occur so Frequently? Airlines cannot afford empty seats. That sounds like an obvious statement, but many air travelers fail to understand the lengths to which an airline will go to guarantee all of the seats are filled. Fact: a number of people with confirmed seats will not show up at the gate. Some are business travelers who buy very expensive flight tickets allowing the option of a late cancellation at no charge. The airline bean-counters have determined the compensation for an airline bump is a good investment if it allows continued overbooking of flights as a matter of policy. All of them have overbooking formulas that in theory compensate precisely for the number of travelers apt to be no-shows in a given place and time. As you can imagine, the formulas don't always work well in all situations and involuntary bumping occurs. That's why some people think Mondays and Fridays (when there is a lot of business air travel) are good days for an airline bump. The same could be true for busy holiday periods or flights to tourist destinations. There are even websites such as Bumptracker that attempt to give you the best possible guess of flight status and times for when an airline bump is most likely.